pyramid sites begun nearly 200 years ago, when America was just barely a nation. The Nile allowed Egypt to flourish from 3000 BC to 30 BC under 30 different dynasties. The first unified kingdom was around 3150 BC founded by King Menes. 1550-1070 BC is referred to as the New Kingdom or 18th Dynasty under Ahmose I, which was the beginning of Egypt’s international trading power. Some of the most well-known Pharaohs, and their wives, existed in this period, including Kings Ramesses II, Tutankhamen, and Queen Nefertiti. The 30th Dynasty was the last native ruling dynasty, and after it fell began 2000 years of foreign rule in Egypt, first by the Greco-Macedonian Ptolemaic line including the famous Cleopatra VII, and then Roman rule. Seeing the Sphinx and pyramids at Giza was easily the highlight of the trip, the Great Pyramid dating back to 2550 BC and standing as the tallest man-made structure for the next 3800 years. 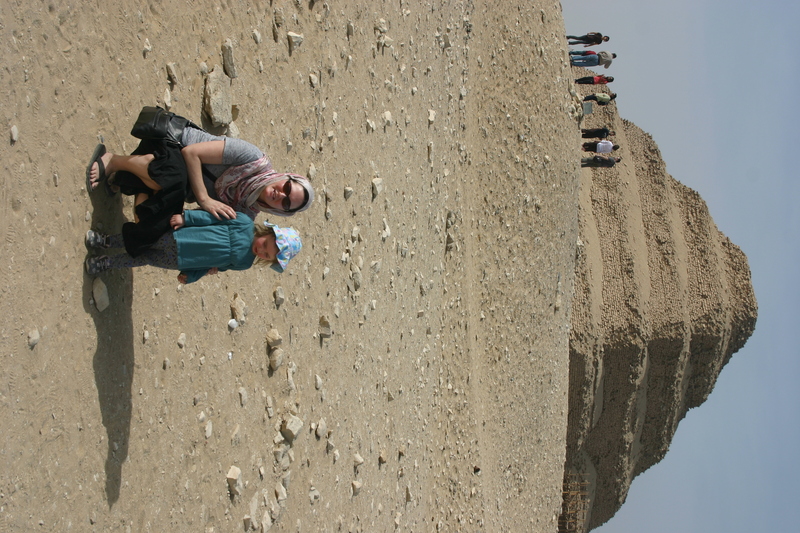 But we also saw two other ancient sites, at Saqqara and Memphis. It is believed the Step Pyramid at Saqqara actually predates the pyramids at Giza, as it is more rudimentary in design than the smooth-sided pyramids at Giza. Dear husband was also quick to remind me of the local beer he sampled bearing its name and image. When our tour bus drove outside Cairo a few kilometers to see three nearby pyramid sites, we quickly got a glimpse of rural Egypt, made up of mostly farmers and agriculture. 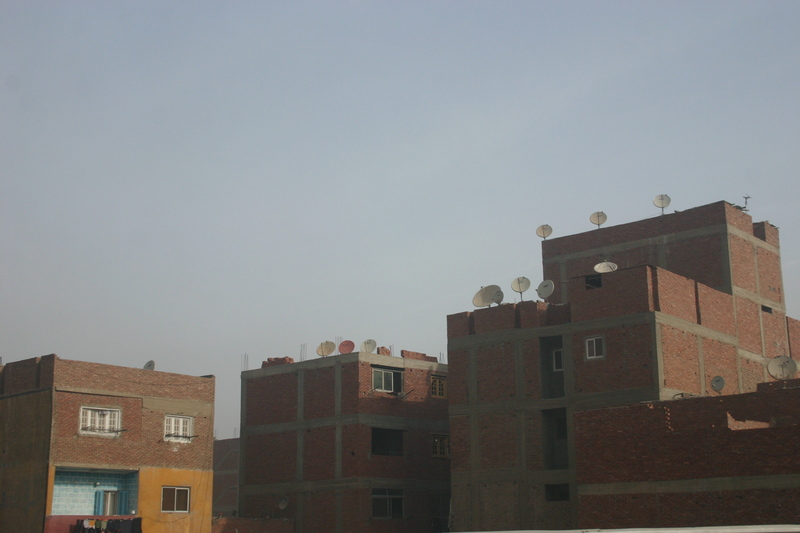 We couldn‘t help but notice what looked like partially completed residential apartment buildings all over the landscape. We asked a couple Egyptians about this, and unfortunately the language barrier was too great. We hypothesized that perhaps it was a government attempt to build housing for its many rural residents who often don’t have running water in their modest homes? Might it be linked to the global financial crisis and this is perhaps why they go unfinished? Again, this was pure speculation on our part, so if anyone knows the answer please let us know. 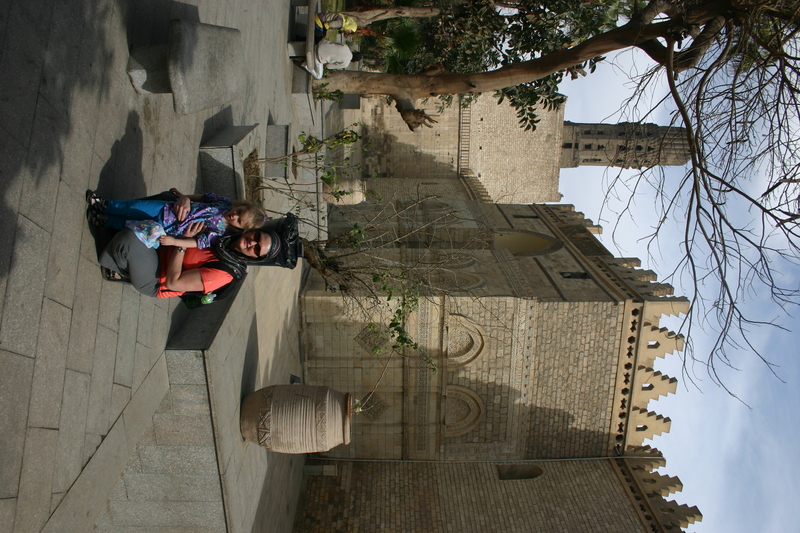 Islam is the official state religion, and around 90 percent of Egypt’s population are Sunni Muslim. We were quickly reminded of the conservatism this brings when it was 85 degrees Fahrenheit and both men and women have their arms and legs covered, and women also wear head scarves. Many travel books suggested modest dress for tourists, especially for women, in order to not stand out or to give offence. Additionally all women must cover their heads to enter a mosque. You’ll see this in some of our photos, especially our three year-old who loves imitation at this age and asked for her “Mary” scarf to be put on her head to be like the other women. One of the more amazing experiences was to hear the chanting that was used to call Muslims to prayer around 5:30am. I was lying in my bed on the 14th floor of a hotel in the urban center of city of nearly 7 million people yet was still able to hear the morning call to prayer – simply amazing! 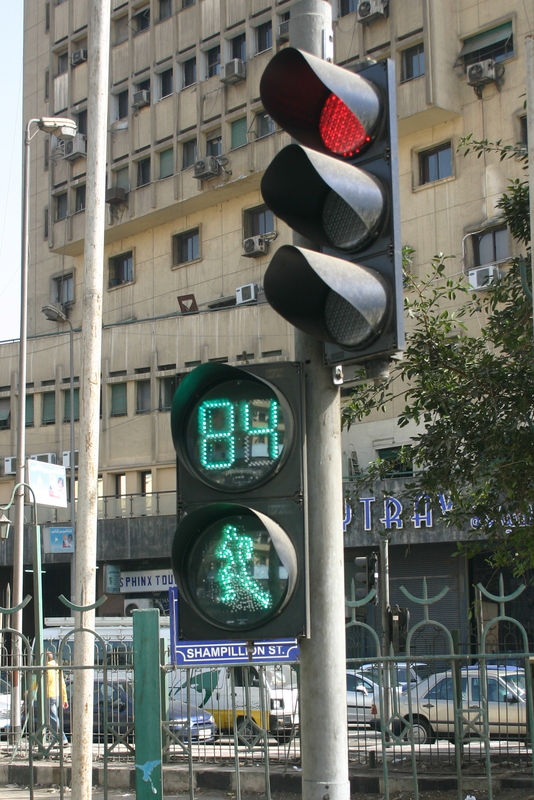 Tipping or “baksheesh” in Egyptian is expected for just about anything, from helping you cross the street to helping to get a taxi to allowing entry to a mosque. It was one of those things we had to just get used to and understand that as salaries are meager compared to Western standards, tips could account for a large part of an Egyptian’s earnings. 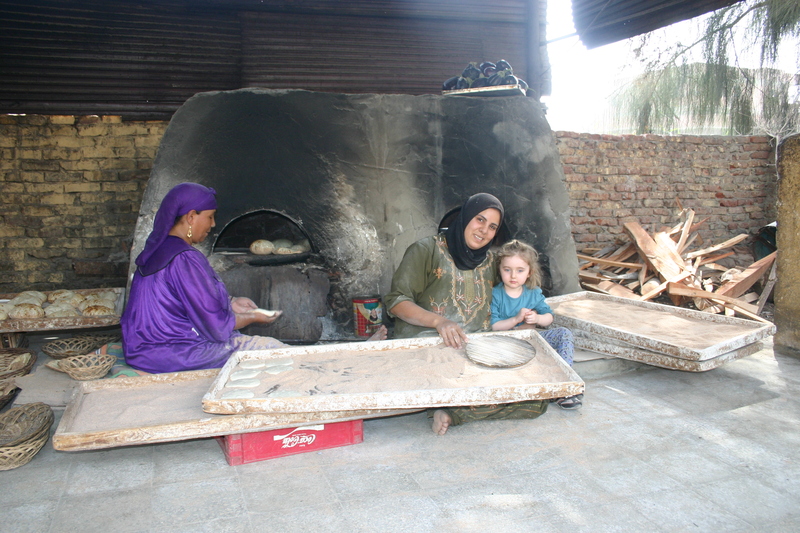 Baksheesh is also definitely negotiable, as was just about anything that was for sale in a store or market. We had some fun negotiating (especially my husband 🙂 ); however, by the end of trip I think we were both excited just to see a price in a store and know it was the correct price. Now onto some more practical matters of traveling to less developed countries with small children. Forget the Sphinx, the bigger mystery is how to check in a person at the airport with an infant on their lap. For some reason, our check-ins take no less than 30 minutes. There always seems to be an issue, either they’ve assigned our three year-old to an exit row; or my passport name contains my maiden name; or they don’t know how to deal with an infant on lap. 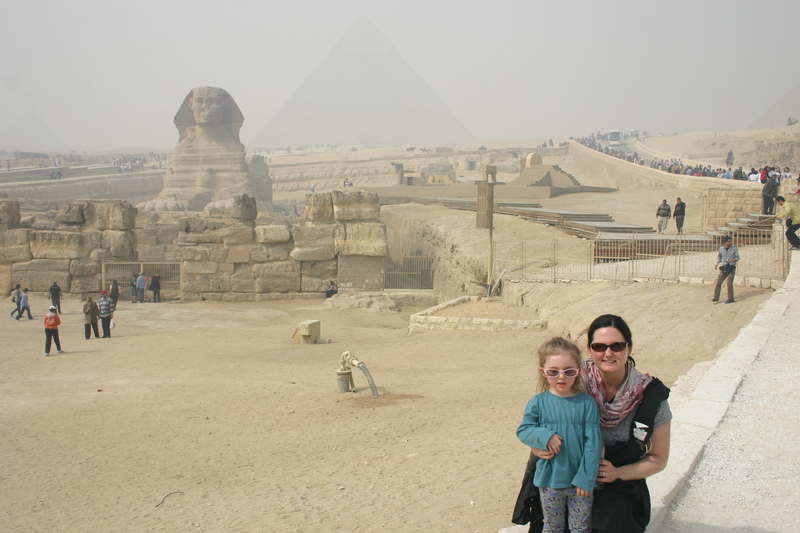 Some air travel differences: on our departure date, we arrived at Cairo airport and had to go through a security check point as we entered the airport before we even got to the ticket counter! There appears to be a quirky mix of what we named real and “fake” or “show” security. Upon arrival at our hotel, we had bomb sniffing dogs sniff the taxi and there were probably five guards standing watching the procedure. It seemed their job was simply to wait for something to happen, which to a bystander seemed to mean they stand there all day and do nothing. Once we were on hotel grounds, we had to walk through a metal detector each time we exited and entered. It went off every time so I’m not sure what good it was doing. On our first day at the Egyptian Museum we passed through three security check points with metal detectors and conveyor belts just like the airport. On seeing a camera in our bag, a guard wanted us to check our Digital SLR Canon at the door; since neither my husband or I felt very comfortable with that, we basically just kept walking with our bags and no one said anything more about it. I would probably not again bring little children to developing nations. For me, I think an appropriate age would be once your children are both out of diapers and out of car seats. Why? It took us the better part of a day to find diapers when we ran out. And let me just say that all Pampers are not created equal. And I never saw a car seat besides my own; in fact, we had to request seat belts when we had a taxi called because otherwise there wouldn’t have been any. 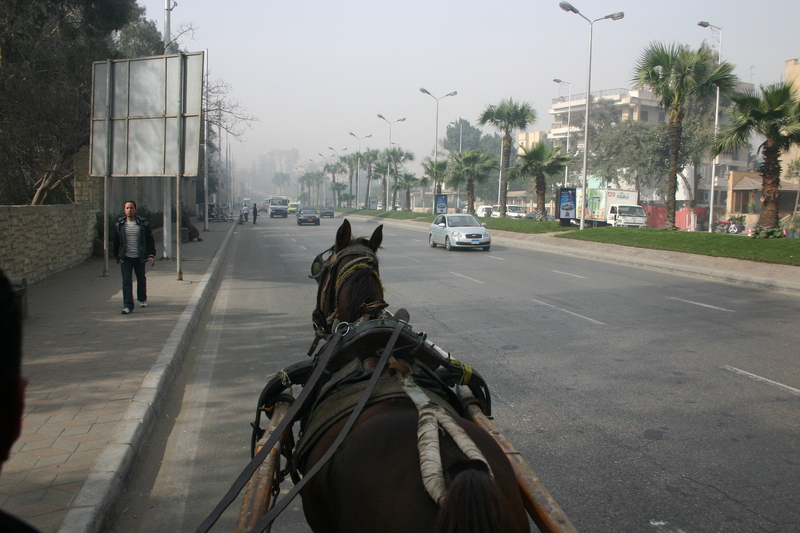 When we arrived at Cairo airport and finally negotiated a taxi fare, the driver led us to his taxi in the parking lot which had no seat belts, and began hoisting our luggage on top of the car. I told my husband if it were just he and I maybe I could have rolled with it, but I had to draw the line somewhere and we let the driver know we needed seat belts for the three year-old and infant car seat. And my three year-old has proven to have a weak stomach, even in London taxis, so I was really just praying she wasn’t going to lose her lunch in one of the wild Egyptian taxi rides. There aren’t lanes, or street lights or stop signs. The taxi driver chuckled when Eric asked him about a cross walk. In fact, I think we saw one flashing pedestrian light the entire trip. And please see the photo. It is not a “walking man” as common in many places in the world, it is a running man, as if to say “hey buddy, you better run for your life or else it may not be a very long one.” I was very much reminded of the popular eighties video game “Frogger” and I was the star. 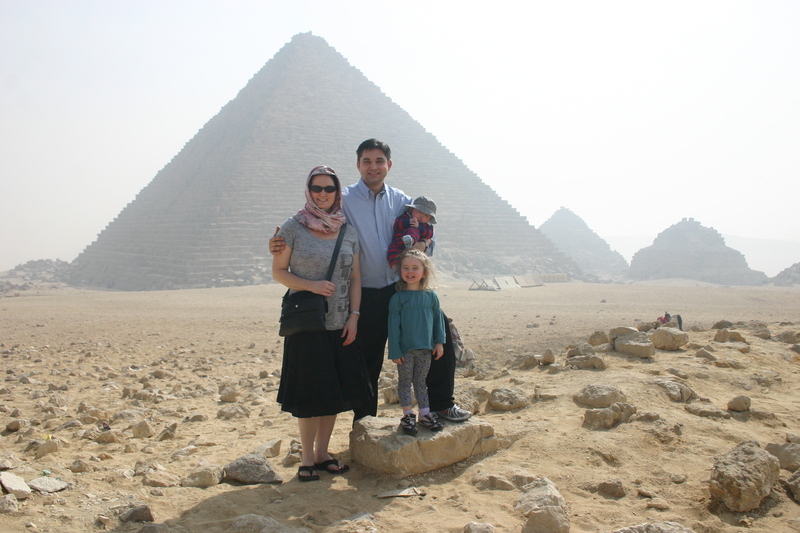 On tour one day, we accepted a horse and buggy tour of the pyramids at Giza, since the area is so vast. We are trotting down a rural street en route to the site, I am holding onto our three year-old who sits in between my husband and I, and our three month old is in the Baby Bjorn, husband protecting his head from the bumps. Just as I am praying we are almost there, we turn onto a five lane highway. And did I mention we were going the wrong way on that five lane highway? I remember visiting Athens 15 years ago and learning it was the most polluted city in the world. I’m sure Cairo is now in the running. While we didn’t see a factory anywhere, later research showed evidence of many unregistered lead and copper smelting plants nearby, causing particulate matter over three times normal levels. The auto traffic is horrendous and with most of the cars over 10 years old, you can imagine the emissions problems. There was a haze that covered the city much of the day, part desert dust, part auto exhaust, part metals pollution. In a country where there is not clean drinking water and such a gap between rich and poor, it is difficult to explain these things to a three year-old. As our tour ventured into some of the rural areas outside Cairo, we noticed many people still live with pump wells outside their houses. And forget finding a public bathroom, again, another challenge in bringing small children. My three year-old kept asking why is it dirty and why was their garbage on the street and how do I answer that in a way she could understand? We had some amazing food in Egypt, mostly grilled meats such as beef, lamb and chicken, usually served with a small salad or vegetables. Eric sampled pigeon one night, and while I wasn’t as adventurous I certainly didn’t have a bad meal anywhere. The bread was fabulous, similar to a whole grain pita bread but so fresh-baked it was simply wonderful. Our three year-old was quite interested in the bread baking and received a quick lesson from a couple of the women outside one of our restaurants. All in all, I am glad we made the trip as we don’t know how long we’ll be living on this side of the planet and at only a 4.5 hour plane ride we are relatively close. However, I can envision my next trip to Egypt being a luxurious Nile River cruise, sans children, or perhaps a five-star Red Sea resort? Hmmmm, I think I’ll have a while to decide. this is so interesting–you really do have a talent for writing about your experiences. Wow, what an adventure! You are braver than me, especially with the little ones. What interesting travel though. I think I would have been slightly nervous about this area, but what sites to see.